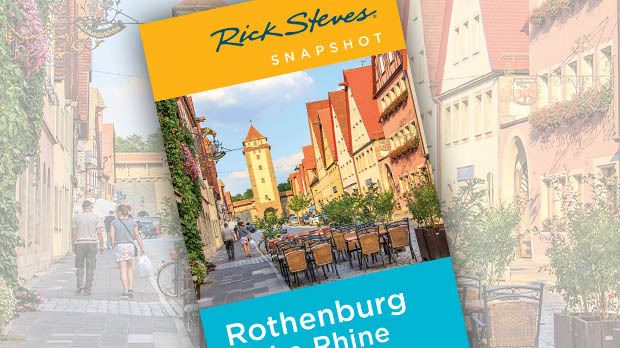 Surrounded by vineyards and filled with atmospheric wine-gardens, this small, tourist-friendly town (just 90 minutes by train from Frankfurt) is easy to navigate by foot or streetcar. Today, 25,000 of its 130,000 residents are students — making the town feel young and very alive. Standing on Würzburg's venerable bridge — the second-oldest in Germany — I squint up at a statue of the town's favorite saint, an Irish monk named Kilian. I wonder why he still has his head on. Killian was one of three Irish missionary monks who dropped by in A.D. 686 to Christianize the local barbarians. Overreacting, inhospitable locals beheaded them. Later their relics were planted in the town's church, putting Würzburg on the pilgrimage map. About 500 years later, since the town was the seat of a bishop, Holy Roman Emperor Frederick Barbarossa came here to get the bishop's OK to divorce his wife. The bishop said "No problem," and the Barbarossa thanked him by granting him secular rule of the entire region of Franconia. From then on, Würzburg's bishop was also a prince. And the "Prince Bishop" of Würzburg answered only to the Holy Roman Emperor. The Prince Bishop dominated the town. The late-Gothic Marienkapelle, the merchants' answer to the Prince Bishop's cathedral, is pretty humble. Since Rome didn't bankroll the place, it's ringed with "swallow shops" (like swallows' nests cuddled up against a house) — enabling the church to run little businesses. Würzburg's City Hall, also humble because of the power of the Prince Bishop, is interesting for a room holding the "Gedenkraum 16 März (March) 1945" memorial. This commemorates victims of the 20-minute Allied bombing that created a firestorm, destroying the town just six weeks before the end of World War II. Pondering models of the bomb damage and the seemingly endless list of names of those killed on that day is a sobering experience. The Prince Bishop's Residenz, in the center of town, is one of the most impressive royal palaces in all of Germany. While devastated by WWII bombs, it has been painstakingly restored. This Franconian Versailles features grand rooms, 3-D art, and a massive fresco by Tiepolo. In 1752, the Venetian master Tiepolo was instructed to make a grand fresco illustrating the greatness of Europe, Würzburg, and the Prince Bishop. And he did. The four continents are each symbolized by a woman on an animal and pointing to the Prince Bishop in the medallion above Europe. America — desperately uncivilized — sits naked with feathers in her hair on an alligator among severed heads. She's being served hot chocolate, a favorite import and nearly a drug for Europeans back then. Africa sits on a camel in a land of trade and fantasy animals (based on secondhand reports). Asia rides her elephant in the birthplace of Christianity. 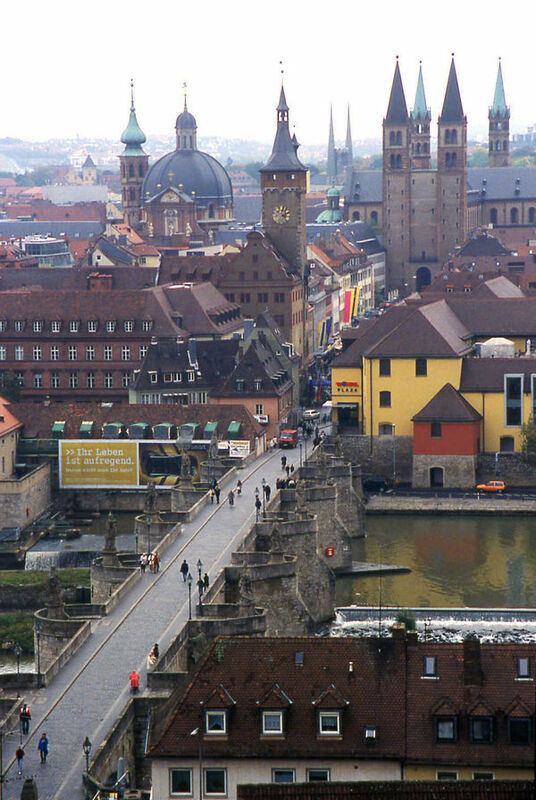 And Europe is shown as the center of high culture — Lady Culture points her brush not at Rome, but at Würzburg. The Prince Bishop had a healthy ego. The ceiling features Apollo and a host of Greek gods, all paying homage to Würzburg and its leader. The sumptuous Hofkirche Chapel, adjacent to the palace, was for the exclusive use of the Prince Bishop and his court. The decor and design is textbook Baroque. Architect Balthasar Neumann was stuck with the existing walls. His challenge was to bring in light and create symmetry — essential to any Baroque work. He did it with mirrors and hidden windows. The chapel is slathered in real — if paper-thin — gold leaf. But the "marble columns" are marbled plaster. This method was popular because it was cheap and the color could be controlled. You can tell if a "marble" column is real or fake by resting your hand on it. If it warms up...it's not marble. The Prince Bishop was as proud of his wine as his fancy palace and chapel. The hillsides around town are blanketed with grapevines — destined to make the famous Stein Franconian wine. Johann Wolfgang von Goethe, the German Shakespeare, ordered 900 liters of this vintage annually. A friend once asked Goethe what he thought were the three most important things in life. He said, "Wine, women, and song." The friend then asked, "If you had to give one up, which would it be?" Without hesitating, Goethe answered "Song." Then, when asked what he would choose if he had to give up a second, Goethe paused and said, "It depends on the vintage." Würzburg has several large wineries that were originally founded as homes for the old and poor, and began making wine to pay the bills. Today these grand Baroque complexes, which have restaurants and wine shops, still use part of their proceeds to help needy seniors. I'll drink to that — and you can, too, in Würzburg.